When your firm or a client is named a defendant in a new lawsuit, it can be helpful to know about the suit prior to being served. 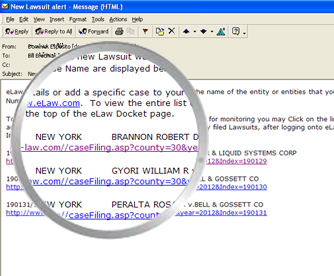 eLaw offers Lawsuit Alert to provide subscribers the earliest available notification of a suit, allowing more time to prepare a potential response. eLaw captures new index numbers purchased in Kings and New York counties. Upon matching and verifying those numbers, Lawsuit Alert notifies registered subscribers when they've been named a defendant - often weeks in advance of actually being served. eLaw's new Lawsuit Alert is a perfect way to market to potential customers, informing them of lawsuits involving them prior to their awareness of the case.